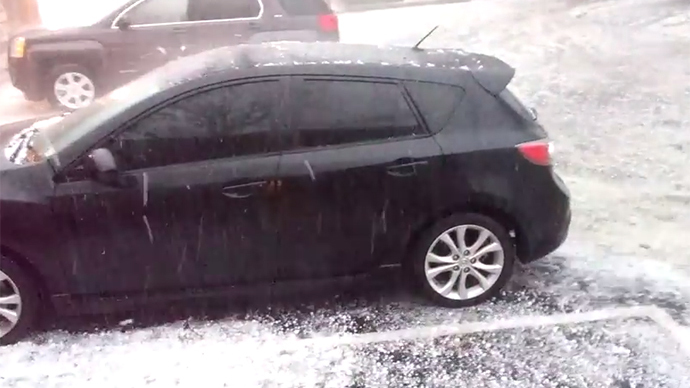 A massive cluster of slow-moving storms rumbled across the Midwest on Tuesday, dumping large amounts of hail in a relatively short period of time. The National Weather Service issued a severe weather watch for much of Missouri. Many communities, particularly in St. Louis, were flooded with rivers of hail when drainage systems were unable to handle the amount of water and ice. 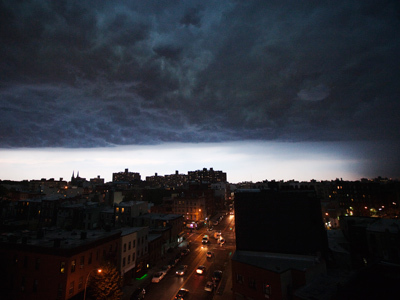 The NWS issued a flash-flood warning for the city. "Runoff from this excessive rainfall will cause flash flooding to occur," the agency said in an alert. 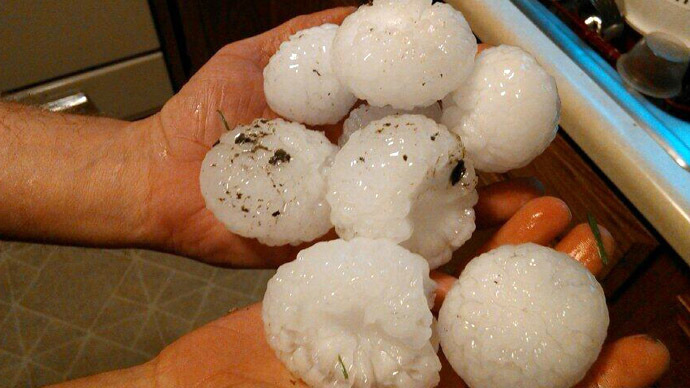 Hail up to the size of golf balls was reported in or near several cities including Columbia, Warrenton and Williamsburg, according to the Weather Channel. Near Affton in St. Louis County, 1.13 inches of rain was reported in just 30 minutes. Farther west in Dutzow, Missouri, 2.25 inches of rain was reported in half an hour. In Augusta, also west of St. Louis, storms produced more than 3 inches of rainfall, NWS meteorologist Laura Kanofsky said. A lightning strike caused a Mississippi River traffic signal on the Eads Bridge linking Missouri and Illinois to malfunction, KMOV-TV reported. Crews notified the Coast Guard to inform any barge traffic of the issue. Missouri wasn’t the only state to suffer the severe weather. Heavy rain triggered flash flooding in southern Indiana on Tuesday morning, forcing road closures due to high water in Orange and Dubois Counties, according to the Weather Channel. Kentucky also experienced flash flooding in Corbin, a town in the southeast. There, one street was impassable due to three feet of ponded water, according to the NWS office in Jackson, Kentucky. The Midwest has faced a rash of severe weather since the beginning of April, with only two days not experiencing severe weather of some kind, KNXV reported. Spring warming and changes in where the jet stream carves a path in the upper atmosphere were combining to increase the chances of severe weather across the Plains on Wednesday and Thursday, the Storm Prediction Center said. On Wednesday, there is an enhanced risk of bad weather across Kansas, Oklahoma and Missouri, including more hail, possibly damaging winds, a tornado, or a combination of all three, AP reported. That threat travels north and east on Thursday across Illinois and eastern Missouri. Other severe storms could form from Michigan to Texas both days. "By Thursday, it looks like all those ingredients come together. The timing looks better. 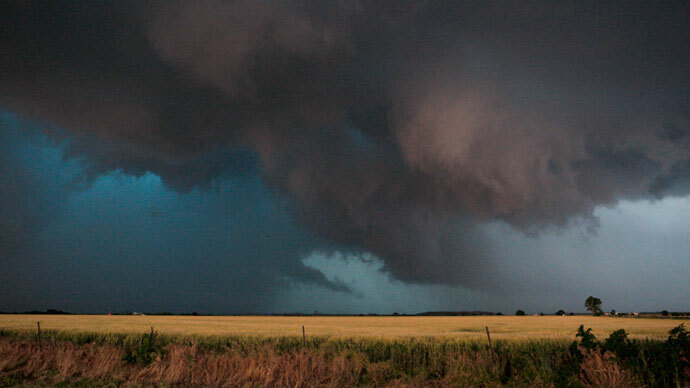 You can really blow up some big storms," Greg Carbin, the warning coordination meteorologist at the Norman, Oklahoma-based Storm Prediction Center, said. Showers and storms with heavy rain and flooding are possible throughout the southeast into Friday.